With Hurricane Irma looming, pre-storm fuel buying panic has set in, and consumers are rushing to top off their tanks before the storm hits. They’re finding, however, that there’s little product to be had, as Harvey’s fuel disruption has depleted the Southeast of fuel. Long hauls continue through the Southeast, as lack of local product force suppliers to look farther out for supply. Given how narrow Florida is, traffic is particularly burdensome. Just two major interstates service the whole state, so as traffic evacuates, nearly everyone travels the same route, in the same direction. For fuel trucks, this means that traffic is extremely difficult to navigate, adding an additional dimension of complication and delays to fuel deliveries. The traffic situation will only get worse as we get closer to Irma impacting Florida. 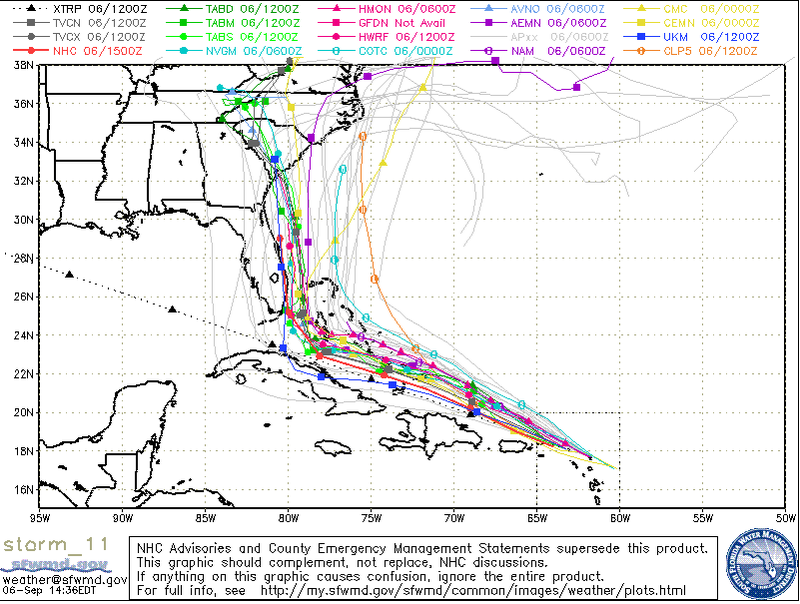 Hurricane Irma has already struck some Caribbean islands, and is forecast to either hit Florida or come very close. Forecasters remain unsure of the storm’s exact track, but expect the storm will at least brush the coast of Florida, bringing heavy rain and extremely high winds. The National Hurricane Center warns that Irma could potentially cause catastrophic damage to Florida, even if the storm does not make landfall. Irma could be either Category 4 or 5 storm by the time it nears South Florida. Assuming the storm keeps its strength, this will be the first time since 1915 that the U.S. has been hit by two storms in the same season at Category 4 or above. Mansfield’s supply team expects terminals in Florida will be shut down in response to the storm. Racks in Miami/Port Everglades will start shutting down on Thursday and Friday, ahead of Irma’s expected impact this weekend. Dallas: Gasoline is still extremely tight as retailers attempt to catch up their supply, so expect long hauls into the region throughout the week. The situation is slowing improving, though. Houston/Pasadena: Diesel supply is showing significant improvements; however, gas remains tight and long lines at racks are still impacting deliveries. Because of the long lines, carrier capacity continues to impact deliveries. San Antonio: Racks are expected to open more by the weekend, but in the meantime supply must be trucked in from other areas. Corpus Christi: Supply still looking better in this area, and continuing to grow healthier. 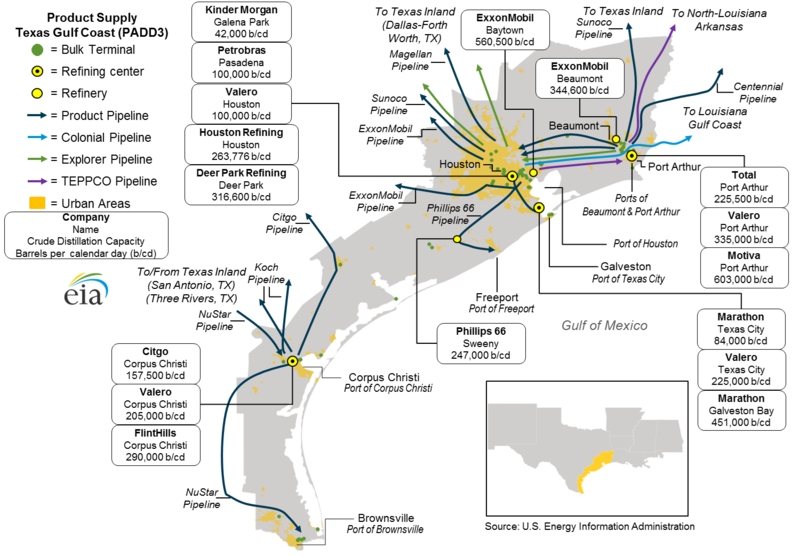 The EIA shared the below diagram of production following Harvey. 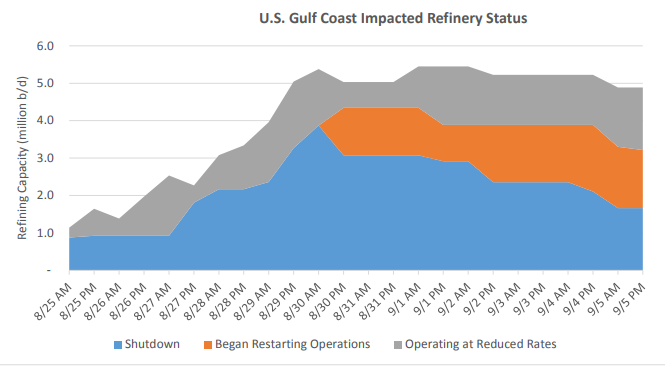 As the chart shows, production reached a peak of 5 million barrels per day (MMbpd) offline at its peak on 8/29, but since then restarts and ramp ups have helped bring roughly 3 MMbpd back online. This has helped bring refined product prices under control, though prices remain elevated in the Gulf and throughout the Southeast. Both diesel and gasoline lines of Colonial are now receiving product in Houston, but deliveries are still significantly delayed. Gas allocation remains extremely tight across all Southeast markets, and suppliers are looking to the Northeast and Great Lakes areas for available supply. Expect this through early next week, depending on the final path of Irma. Diesel is slightly improving, despite being tight along spur lines; long lines at racks continue impacting all deliveries from Mississippi to Virginia. Daily gas and diesel demand has doubled up the eastern seaboard as consumers attempt to top off tanks to weather the shortage. Expect the situation to begin improving around Sept 12 or later, when pipeline shipments begin arriving through the Southeast. Tampa faces the most severe shortages currently, particularly for diesel fuel. Traffic is severely impacting deliverability. Ports are watching the storm and continuously evaluating whether shutdowns are necessary. Since all supply in Florida is traditionally brought by barge, closing ports would be a significant blow to supply in the area. Mansfield expects high demand and limited supply through next week. Mansfield continues to work around the clock to help our customers fuel during the storm. If you have any questions or need to secure supply in Texas, Florida, or the Southeast, please reach out to your sales rep or customer relationship manager for more information about ordering product. Please place orders 48-72 hours in advance whenever possible, to allow time to secure supply and freight during the shortage.